Eleven days ago we posted a first article  on the strikes and workers’ protests in Iran in which the idea of independent soviets or councils (in Farsi “shura”) was first raised. Since then, despite all the regime’s desperate efforts to deal with the workers’ movement by engaging the help of the opposition, so far, it not only has failed to curb the movement, but rather the reverse has taken place. The strike movement and workers' demonstrations are not only becoming more widespread across the country, and occurring on a daily basis, but their militancy and radicalism is increasing. Faced with such a situation, the next step the regime seems to be preparing in order to halt the protest movement is the adoption of more intense "anti-imperialist" declamations and more warmongering speeches with the aim of imposing more "war-time" conditions on the country, to achieve their malevolent aims. It cannot be emphasised enough how important it is that this strike is linking up with other strikes and gaining the solidarity of workers. It is encouraging that in the last few days we have witnessed solidarity right across the country, not only symbolically but also on the streets and in industrial units. 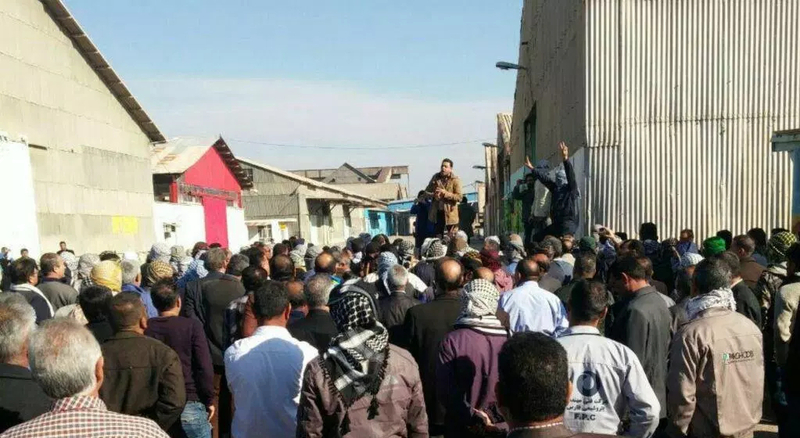 The slogan of the Ahwaz steel workers’ demonstration, "Foolad, Haft Tapeh, a Happy Unity"  illustrates the tireless activities of the workers in this very difficult situation. As we noted in our previous article women have also been in the forefront of the struggle alongside the predominantly male workforce. Similarly, the students’ slogan of "We are Children of Our Workers, We Stand By You" has been a great slogan for working class families as a whole to rally around. Even the shopkeepers of Shush (who have been extending credit to the workers for months) shut up their shops in solidarity with the workers. On the other side of this line-up, is the United States with its regional allies, namely Saudi Arabia and Israel. Regardless of the turmoil and havoc that this heterogeneous triangle has created and keeps creating, it seems that, as in the Bush period, they will eventually unwittingly help Iran advance its policies in the region. The endless, unbridled, impetuous and tedious attempts by the Trump government to resort to any true or false (in most cases) pretext, seems to lead to greater isolation of the United States. An interesting example of this kind of unscrupulous attempt backfiring was the recent accusation that Iran is hiding chemical weapons stockpiles. Not only has this not got any support from Russia and China, it is unlikely to get much approval from the EU either. This confrontation, whether it ends up in direct conflict or as a war of words, whether sanctions will intensify or the negotiation process will re-open, nevertheless will primarily affect the working class. Whatever these developments turn out to be, one way or the other it will be the people in general and the working class in particular who pay for it. For the working class the only way to contend with it, is to intensify the class struggle. The shining example is how the workers stopped capitalism’s First World War, in 1917-18. On the other hand, whilst US sanctions, which don’t exclude humanitarian items like medicine , will undoubtedly increase the misery of millions they will also arm the regime with the propaganda weapon that any resistance is equivalent to working with the enemy. dw.com. By “us” here we assume he means the Islamic State and its corrupt ruling class.